This is a large 2’X4′ Painting on 3/4″ Marine Plywood sealed front and back for outdoor display. It was intended for a beautification project for the city of Harrison sponsored by the Harrison Art League. The project was never completed which worked out very nicely for me, as I was very happy with the finished painting. 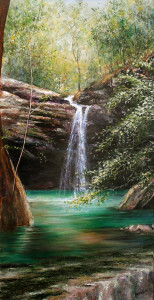 It is a view of one of my favorite swimming holes in Newton County. The Original Framed 24×48 Acrylic painting on board is SOLD, a limited number of matted prints are available with or without a frame.